In the next few days I will leave my home and set out on a new adventure so, before leaving, I wanted to post a visit about the most well known architect in my country, GAUDÍ. Besides being a great figure of the Catalan Modernism, Gaudí’s work attracts thousands of tourists to Barcelona from all over the world. 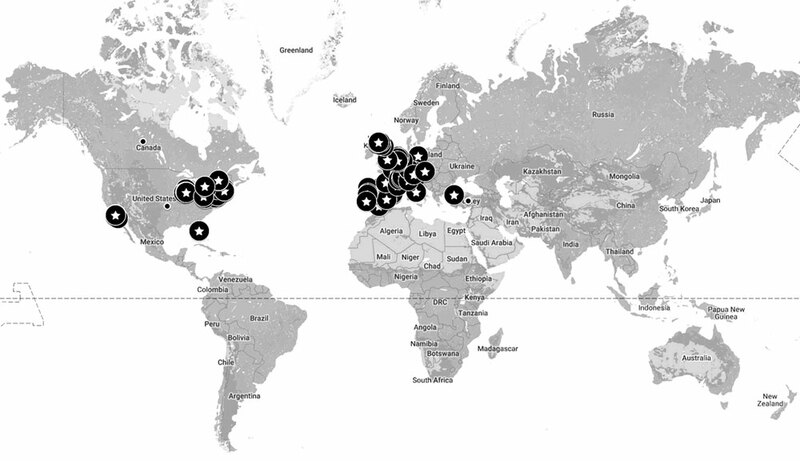 I am sure that many of you have already visited some of his most famous buildings, whether you are from Barcelona or not. Nevertheless, not only did Antoni Gaudí build la Pedrera, el Parc Güell or the never-ending Sagrada Familia, but he also has another unknown buildings which are really interesting. Before I move on, I have to admit that I am not a great fan of Gaudí’s work, and I never thought he would appear among my visits. 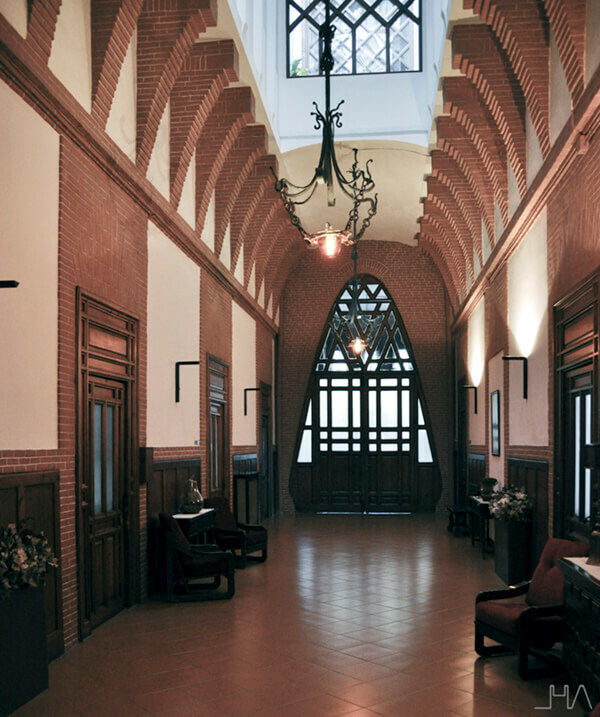 However, I could not resist the temptation of showing you the suggestive corridor located in the first floor of the College of the Teresianas, which is among the less known works of the Catalan architect. First of all, let us take a moment to know about its peculiar history. 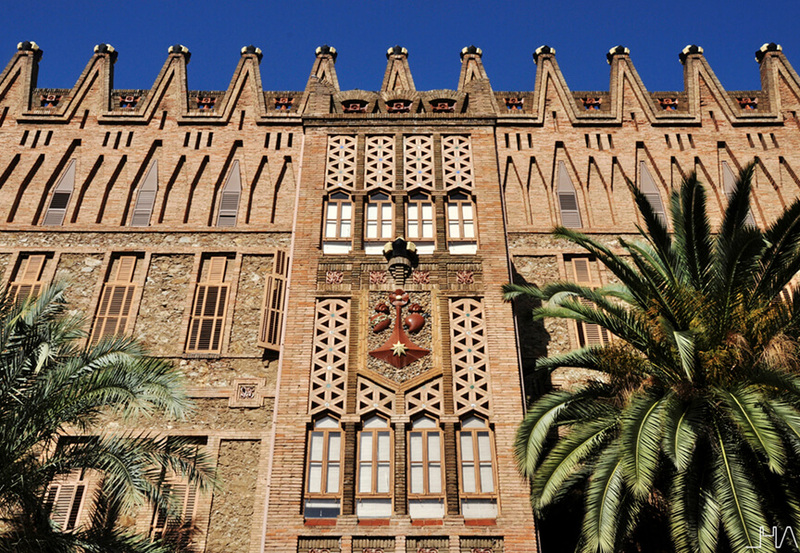 It was in 1887 when an architect named Joan Baptista Pons i Trabal began the construction of the College of the Teresianas. 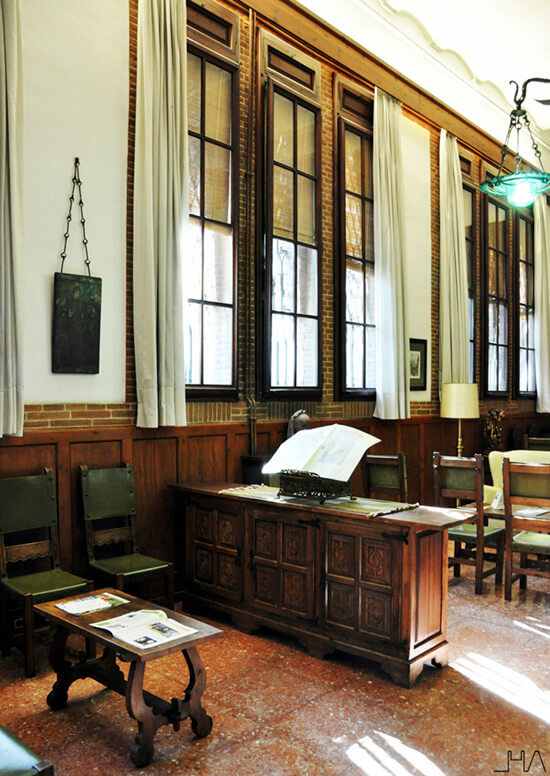 The commission was to build a college, a boarding school and the Convent for the Order of Saint Teresa of Jesus. 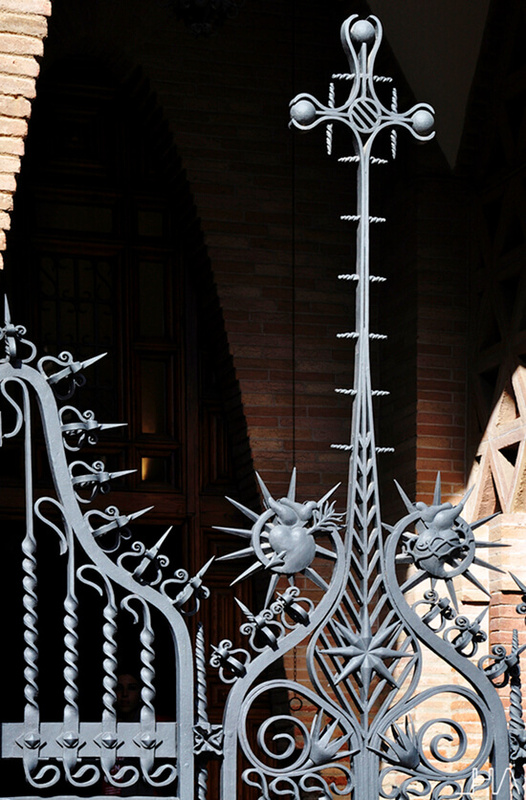 Nevertheless, in 1888 the project passed into Antoni Gaudí’s hands. It was Enric d’Ossó i Cervelló, the religious in charge of the congregation, who decided to change the architect. At that time, Antoni Gaudí started to be well known as an architect, and his condition of being a very devoted person convinced the religious to change the designer. In 1969, the building was listed for its cultural interest. When Gaudí took the project, the main block foundations were already built, so he had to respect the shape of the floor plan. Even so, he changed the structure system of the building. 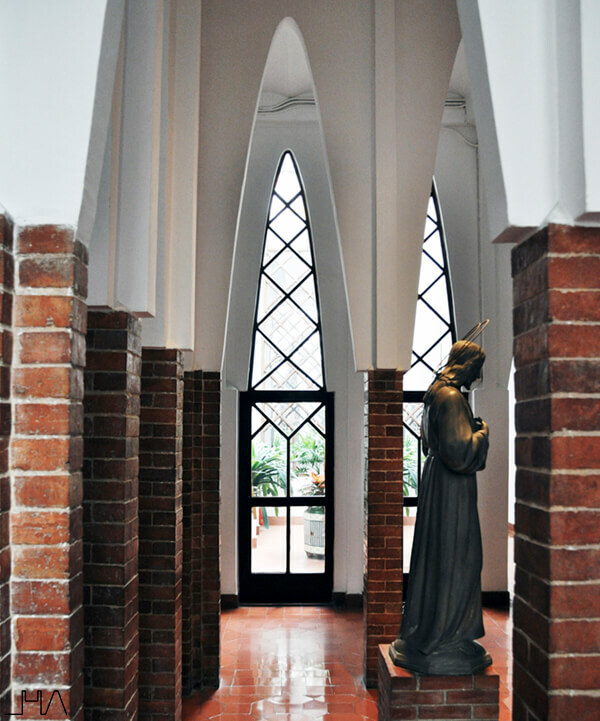 He introduced two inner patios to provide the different floors of the college with natural light. 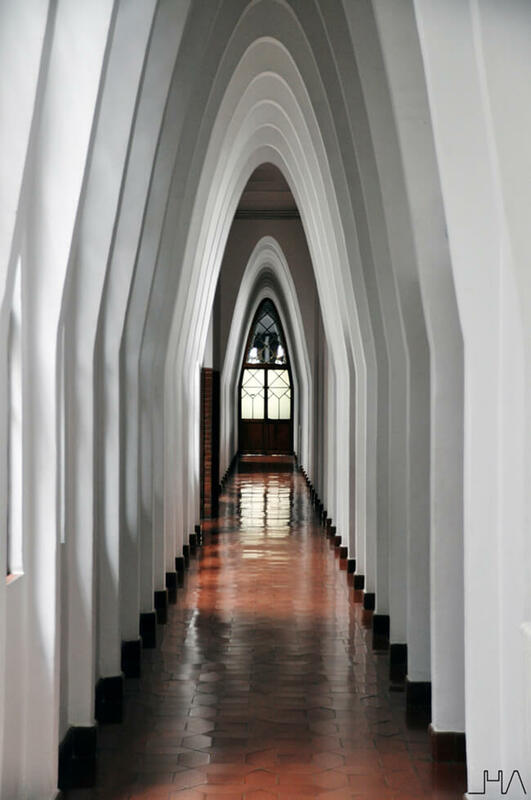 The nuns wanted to show their vow of poverty in the building, so the architect used bricks and crushed stone as main construction materials due to their low price. 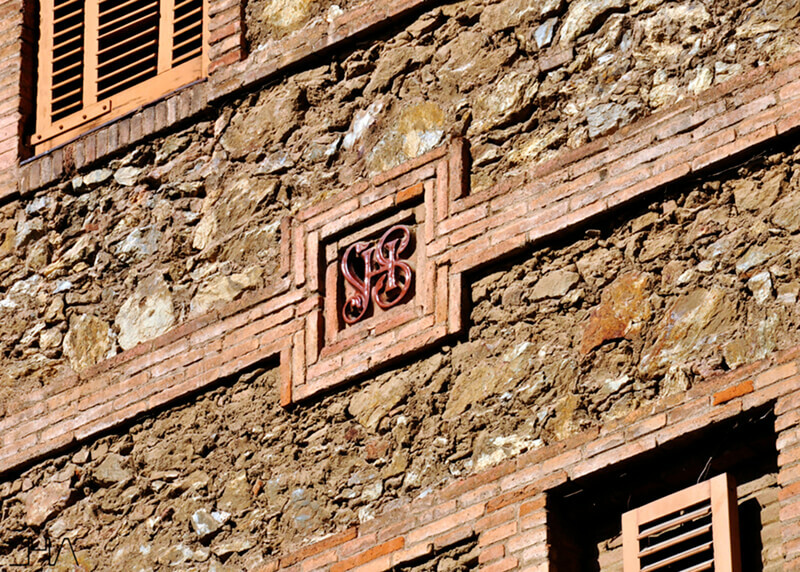 Even so, Gaudí wanted to introduce his distinctive decoration, so he placed the bricks in different ways to create decorative elements. He had a tight budged, but he claimed that it would not increase the final cost. 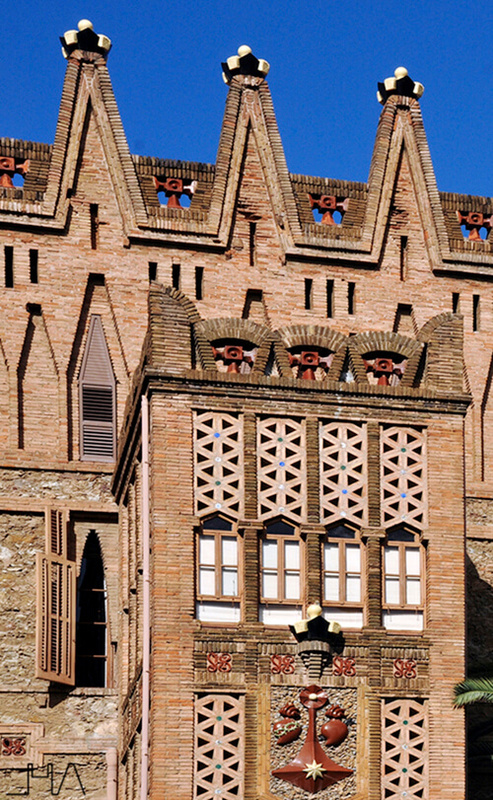 Thus, the façades austerity is mitigated by the materials composition, apart from the ceramic elements that provide the very well-known symbology of Gaudí. 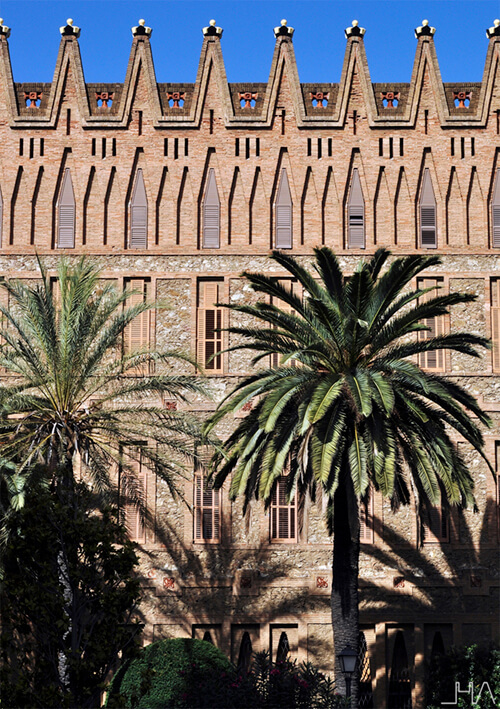 The building has a very particular appearance, crowned by crenellation with Saint Teresa’s doctoral biretta. 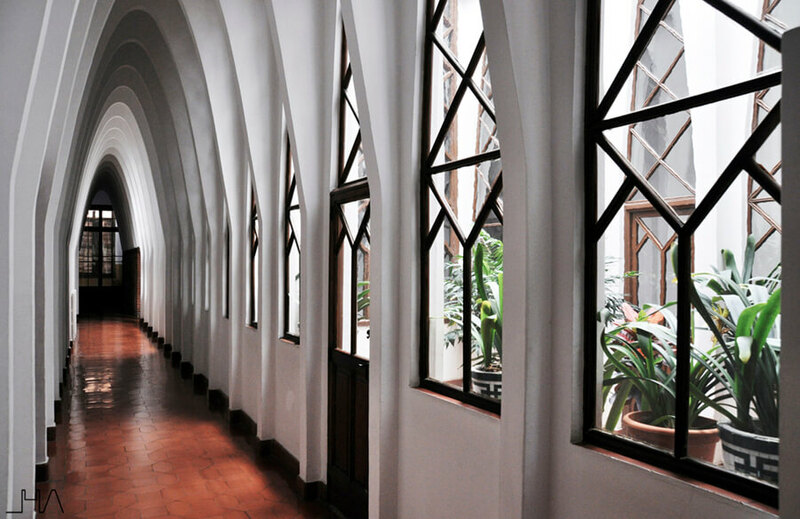 The windows are shaped by interesting parabolic archs. The entrance porch in the main façade is full of symbolic elements. In this post we will not study or analyze the symbology, but I would like to highlight the beautiful wrought iron grill in the entrance. It contains the hearts of the Virgin Mary and Saint Teresa crowned by a cross. A curious fact is that the entrance door, which is plenty of religious symbols, can not be open from the outside because it does not have a lock. 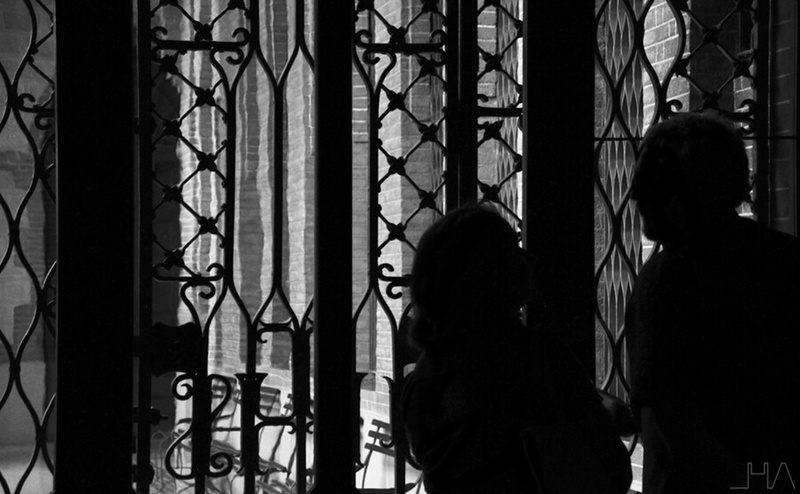 Once we were inside the building, I was surprised by the darkness of the central area in the ground floor. It is a great space with rooms in both sides, and its dim light comes mainly from the inner patios placed in the ceiling. 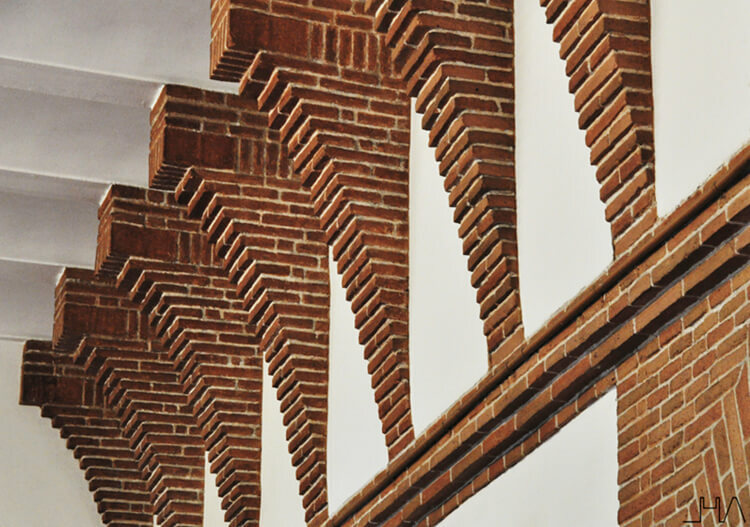 The structure lends the space a distinctive character, thanks to the huge parabolic archs made of bricks. We can see in this floor that the building structure does not continue in a vertical way. In the top of the walls there are corbels to transmit the vertical loads from the corridor in the upper floor. Finally, we arrived to the spectacular corridor in the first floor. 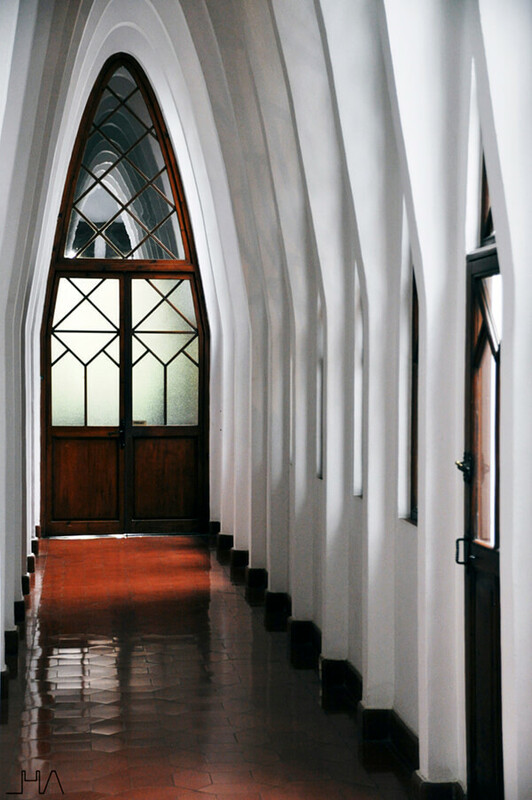 A corridor made of a series of parabolic archs with plenty of natural light thanks to the inner patios. 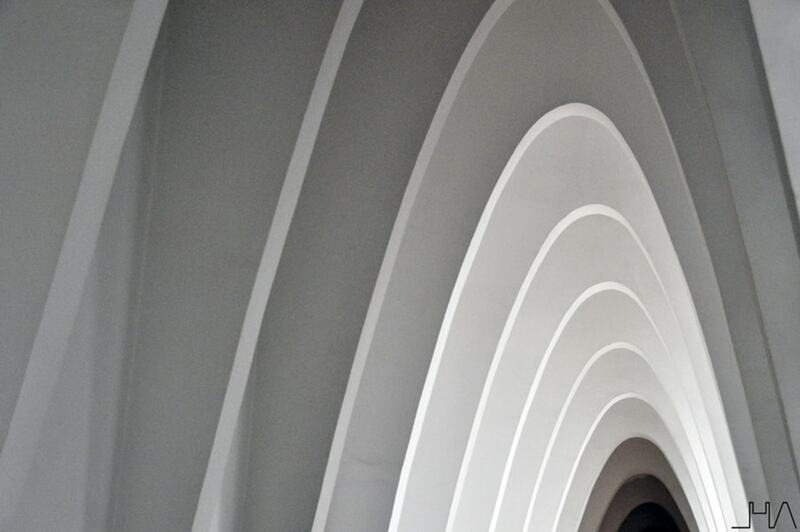 These archs, apart from having a structural function, distribute the light in a very characteristic way. The truth is that once you arrive to the first floor and start roaming around in these corridors, the worst moment is when you have to leave them. To conclude, I want to tell you some curious things related with the symbology that affects the building shape. I think that you would like to check it when you can do your own visit. Let us start by the west part of the first floor, where there is an interesting colonnade just at the end of the famous corridors. The pillars are made of bare brick, and while the ones in the north alignment have 26 pieces, in the south they only have 25. 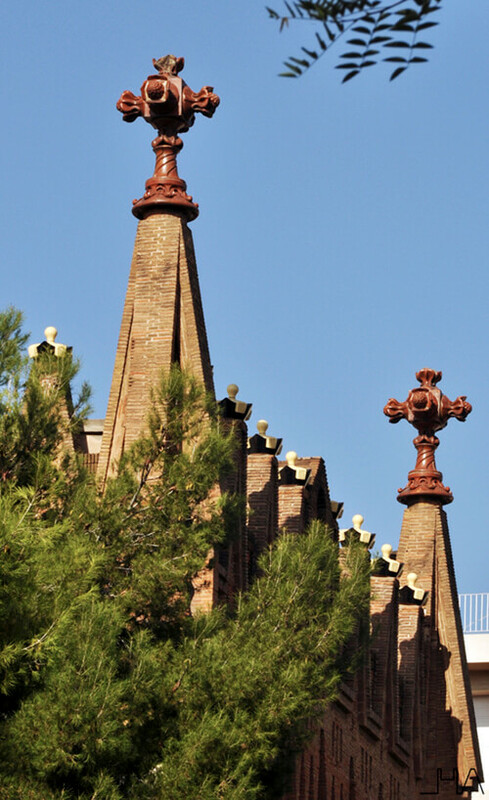 Even though both alignments have exactly the same height, Gaudí wanted to distinguish them to represent that it does not exist the perfect symmetry in the nature. Another curious fact is that in the first floor there is a bare pillar that represents God, and by its side there is a staircase which had to go to the second floor. Gaudí interrupted it before arriving to its destiny, so that there is a staircase of fourteen steeps that does not go anywhere. To conclude, I only hope that if you have the opportunity to visit the College of the Teresianas, you can send me a picture of this staircase to complete the collection. ← LA CITÉ FRUGÈS. A modern neighborhood for the working class.